Precious metals futures on Friday rebounded from their sharp prior-day losses, and most advanced on the week. Gold was the exception, failing to recover completely from a settlement on Thursday that was the lowest in over 6 years. Gold for February delivery climbed $15.40, or 1.5%, to close at $1,065 an ounce on the Comex division of the New York Mercantile Exchange. "Gold is trading in line with aggregates such as the dollar, as battered investors try to understand the implications of the new era of the Fed rates for gold," Bloomberg News quoted Matthew Turner, an analyst at Macquarie Group Ltd. in London. On Wednesday, the Fed raised interest rates for the first time in nine years. Gold held steady until Thursday, when it settled at its lowest level since Oct. 30, 2009. Across the entire week of trading, prices fell 1%. They lost 0.8% last week after rallying 2.6% the week before then. Gold prices have now declined in eight of the last nine weeks and they are down 10.1% from their final 2014 settlement price of $1,184.10 an ounce. The results of Kitco’s professional survey were similar to the online results as there was no clear majority in sentiment. Out of 36 market experts contacted, 17 responded, of which eight, or 47%, said they expect to see higher prices next week. At the same time, six analysts, or 35%, expect to see lower prices, and three people, or 18%, are neutral." Elsewhere, silver for March delivery surged 39.3 cents, or 2.9%, to settle at $14.096 an ounce. Silver prices advanced 1.5% on the week, trimming their loss on the year to 9.6%. As recently as Monday, and nearly again on Thursday, the precious metal posted its lowest close since July 30, 2009. January platinum gained $16.10, or 1.9%, to $860.80 an ounce, rising 2% from a week ago. Palladium for March delivery added $1.50, or 0.3%, to $558.95 an ounce, advancing 2.6% on the week. 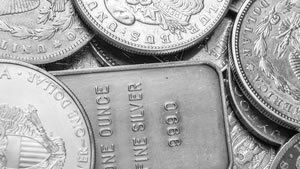 Until their weighty losses on Thursday, platinum was riding a four-session winning streak and palladium had logged a third straight day of gains. Year-to-date, platinum has dropped 28.8% and palladium has plunged 30%. Gold rose $13.10, or 1.3%, to $1,062.50 an ounce. Silver fell 26 cents, or 1.9%, to $13.82 an ounce. Platinum added $4, or 0.5%, to $852 an ounce. Palladium fell $15, or 2.6%, to $553 an ounce. Compared to a week earlier, gold declined 0.9% and silver fell 0.7% while platinum rose 1.9% and palladium gained 1.8%. Most United States Mint bullion products have sold out and 2016 editions will not launch until Jan. 11. The biggest bullion news this week was the sellout on Tuesday of American Silver Eagles at a record 47 million. The all-time annual high jumped 6.8% from the previous 2014 record of 44,006,000 coins.